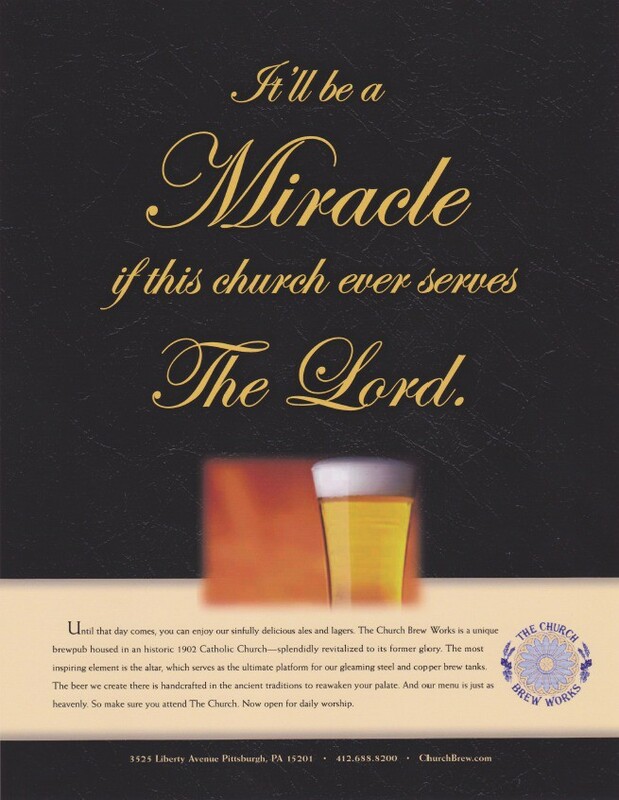 OBJECTIVE: Develop ads that position The Church as a unique drinking and dining destination for locals and tourists alike. SOLUTION: Do in-depth research on the brewery with extensive sampling. Then, feature the most unique aspects of The Church and its interesting brewing process. RESULTS: Our on-site research increased beer sales. Creative development took place at the bar, next to the confessional, which also led to a notable increase in sales. COPY: Until that day comes, you can enjoy our sinfully delicious ales and lagers. The Church Brew Works is a unique brewpub housed in an historic 1902 Catholic Church—splendidly restored to its former glory. The most inspiring element is the altar, which serves as the ultimate platform for our gleaming steel and copper brew tanks. The beer we create there is handcrafted in the ancient traditions to reawaken your palate. And our menu is just as heavenly. So make sure you attend The Church. Now open for daily worship.